Yikes! I'll be eating my Sunday Supper at work tonight. Today marks the start of "the season" and I'm already freaking out a little bit about sticking to my Cook From Scratch goal. Thank goodness for the Instant Pot is all I can say! Today's Sunday Supper will be Crack Chicken Casserole. I've shared, or at least mentioned a recipe for crack chicken here before, but this time it will be in casserole form. Crack chicken is one of the rare dishes that everyone in the family likes but it needs to be served with or over something else. Served over rice or pasta or eaten sandwich style and served on sub rolls. Notice there's three options there? That's because there are three of us in the household now... and while everyone likes crack chicken, no one can agree on what to eat with it. 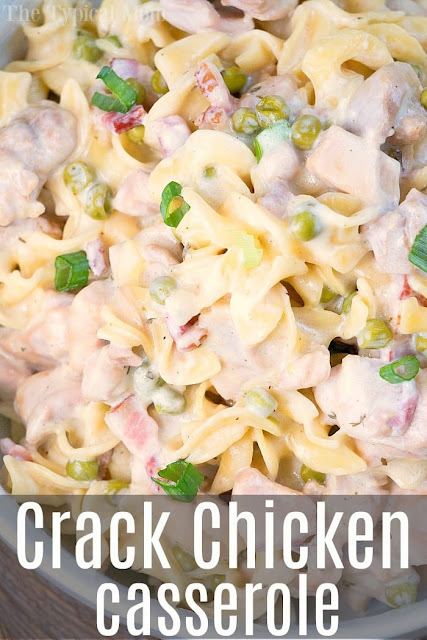 Crack Chicken Casserole will solve that dilemma. It's made with egg noodles. And peas. I love peas! Of course, I'm the only one who loves peas but.... The recipe doesn't call for that many of them and there's plenty of other taste going on with crack chicken. If they don't look too hard, they'll never know there are peas in there. Or at least that's what I'm telling myself. And I'll tell them that too! Honestly, I don't care if no one else eats it. I will like it. It's quick and easy to make. Quick and easy enough for me to make it before going to work. And I can take a big old bowl full with me and have a cooked from scratch meal. And if the folks at home don't eat it well, then I'll have it for lunch a couple of times this week. Win/win. I love a good casserole especially ones with peas and noodles.